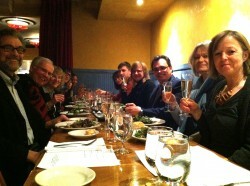 Members of the Minneapolis-Tours Sister Cities Association and Alliance Française gathered at Cavé Vin Restaurant to celebrate Fête de la Chandeleur. About 40 guests attended the event to enjoy a wonderful menu of Salade Printemps (mesclun greens, roasted grapes, hazelnuts and red wine vinaigrette), Savory Crêpe (buckwheat crêpes, chicken confit, caramelized forest mushrooms, brie, saba), Dessert Crêpe (banana, chocolate hazelnut, house-made ricotta), and Sparkling Cider or Crémant d’Alsace Brut. The price was just $15. Sign up on our website to watch for future events like this to join in the fun, and participate in cultural exchanges with the City of Tours, France. Originally celebrated by the Romans to honor the god Pan, participants would roam the streets waiving torches. Adopted by Pope Gelasius in 472 C.E. and set on February 2 (40 days after Christmas, marking the presentation of Jesus in the temple) the holiday of Candlemas came to mark the end of the Christmas season. The connotation with light was borrowed from the Romans and churchgoers would traditionally carry a candle home from the evening service. Making crêpes at this time of year was seen as auspicious by farmers hoping to improve their harvests. It is traditional to hold a coin in your writing hand and a crêpe pan in the other, and flip the crêpe into the air. If you manage to catch the crêpe in the pan, your family will be prosperous for the rest of the year! Si la louve se met au soleil, le 2 février: six semaines d’hiver derrière. If the she-wolf suns herself on February 2, six weeks of winter are behind her. This post is courtesy of Bob Corrick and Christina Selander Bouzouina.